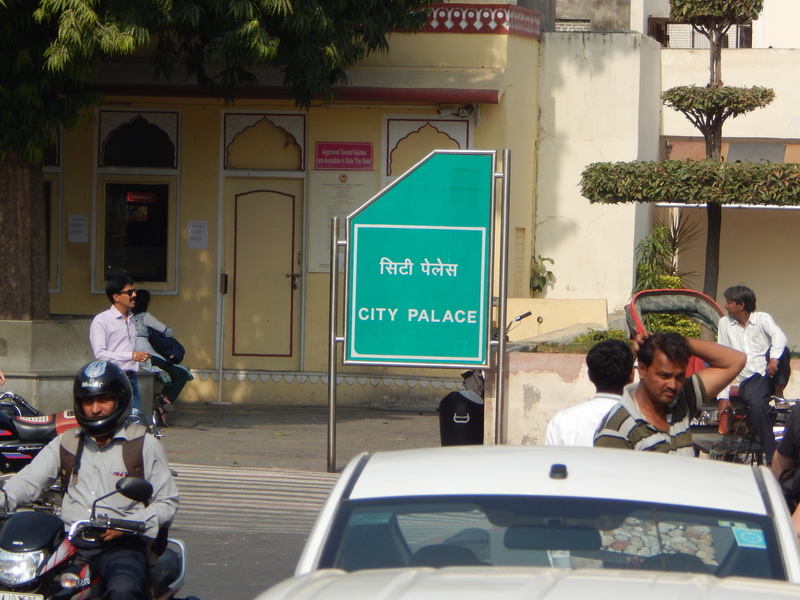 Jodhpur is to New Delhi as Boston is to New York City. 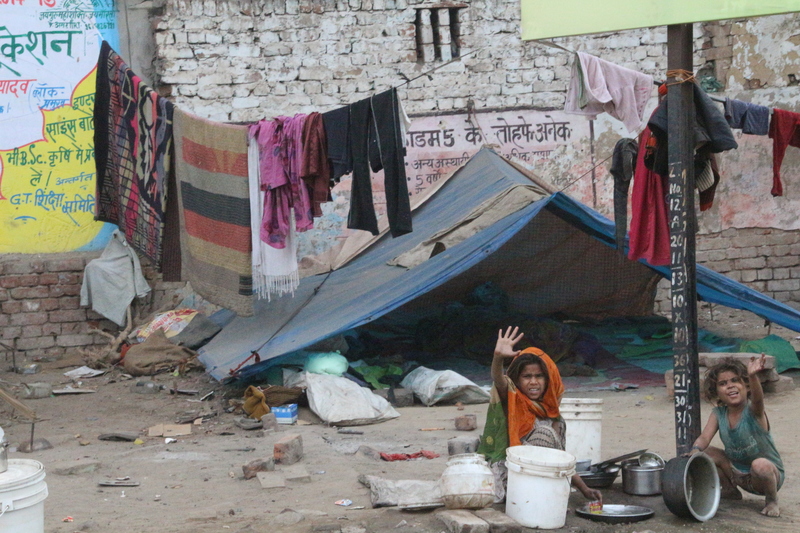 Compared to New Delhi’s 22 million people, Jodhpur’s 1.3 mil seems downright quaint. The traffic is calmer, the streets less crowded. It’s often called the Sun City for its sunny climate (and a record high of 129 degrees Fahrenheit in May!) 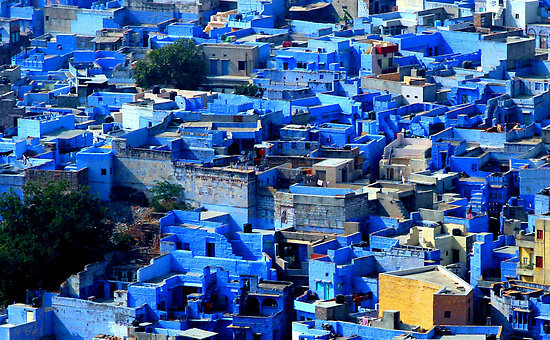 or the Blue City, because they were jealous of the Pink City and decided to paint a large number of their buildings blue. Just kidding – they too painted their buildings for a royal visit. You’ll see a lot of signage for military forces – Army, Air Force, Border Security, etc. Its prime location and extra space makes it a perfect headquarters. We took a package tour that promised to show us “village life.” Not quite equivalent to a trip to Old Town Williamsburg or Plymouth Plantation, this tour was more like if you went to an American suburb in the 1950’s. Our stops did not represent a far-distant past, but they were most certainly hiding away any modern conveniences like cell phones. I’d say it was fun; but if I was a tour guide, I might design this excursion differently. We visited the home of a master potter. His family all worked there, but clearly deferred to the master of the house. They created fun trinkets for tourists, including small authentic oil lamps. 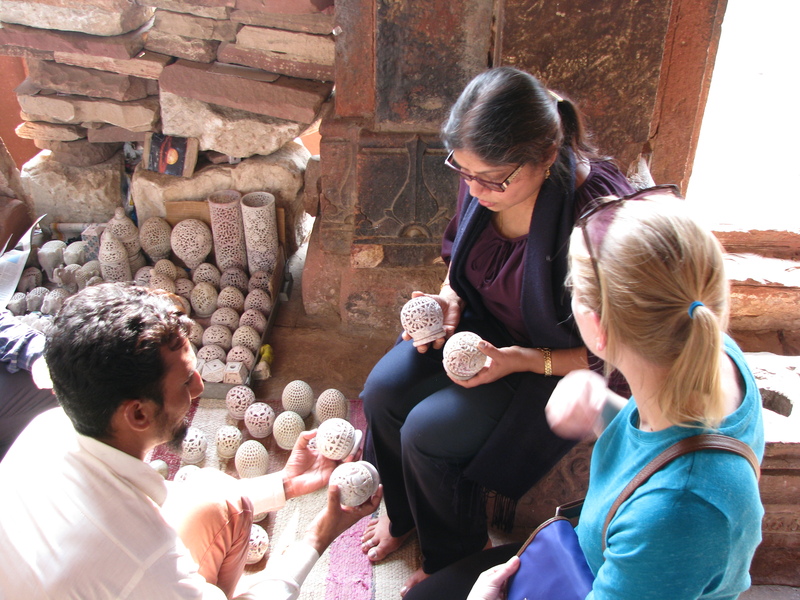 But another large part of their inventory was clay water containers that keep water cool even in the boiling Rajasthan climate. Baby hiding a cell phone! 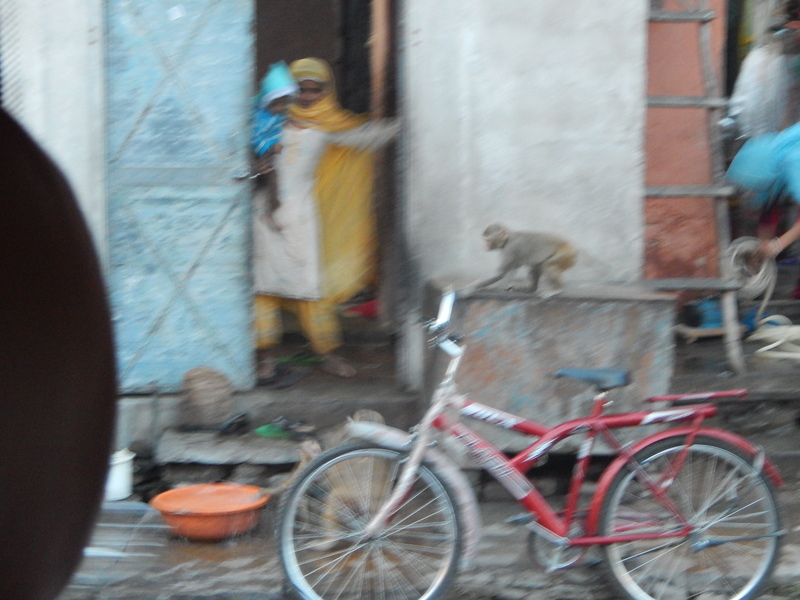 This stop was at a local Bishnoi farmer’s home. He must be the jolliest man in all of India. He has clearly been welcoming tourists to his farm for years and loved every second of the attention. We has left out three piles of different kinds of grain so we could touch and taste. 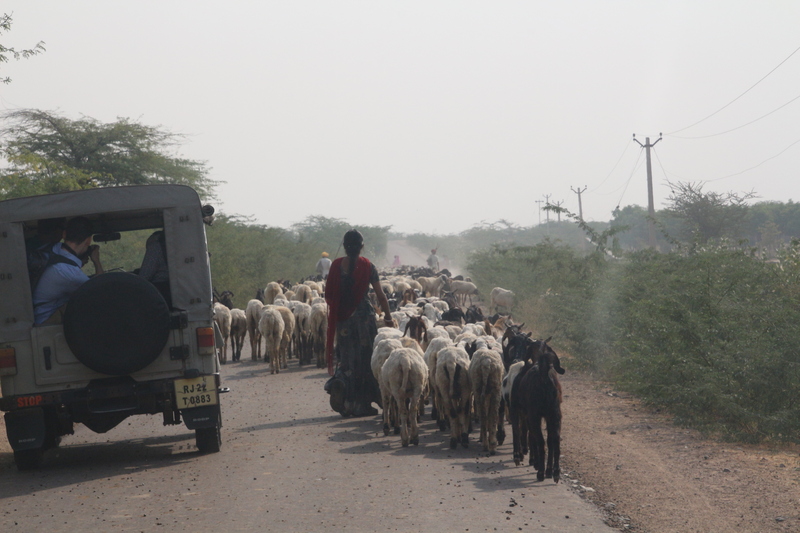 The Bishnoi are a religious group in this geographic area who follow 29 tenets, many of which emphasize protecting the environment, especially trees and livestock. In 1730, 363 men, women and children were killed protecting trees, hugging them to prevent the king’s men from cutting them down. While the women of his family lounged in the shade of their small home, the farmer lead us to a shaded space meant to welcome visitors. There he demonstrated the local custom of making opium tea for guests. It sounds exciting and risqué, but honestly is tasted disgusting – like dirty water and no, I did not feel any different. 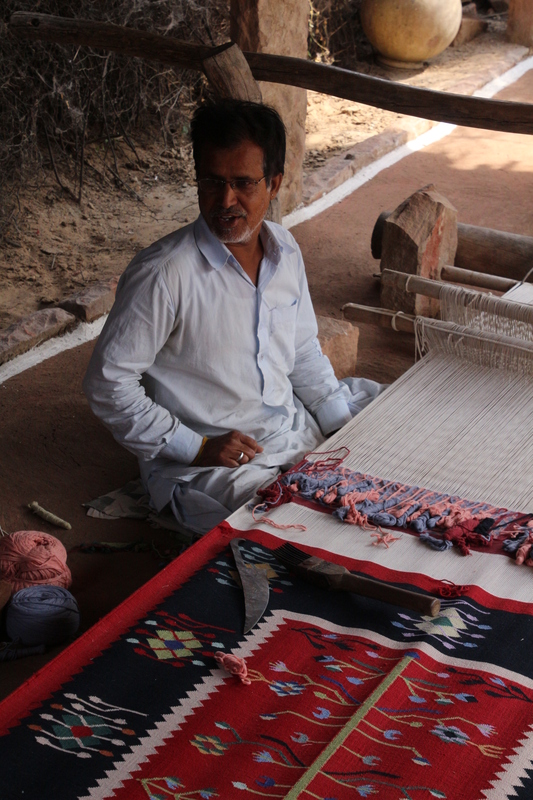 Next he demonstrated how to wrap a Rajasthani turban – a red or red/yellow/green fabric strip that shaded their heads or could be unraveled for all sorts of emergency or everyday uses, like tying things. I really didn’t mind that his operation wasn’t 100% authentic. Clearly, he got a small stipend for welcoming people and putting on these demonstrations, and he did it with joy – a win-win. A clean, orderly man sat beneath a canopy and knotted a rug while listening to the radio. His impeccable English and good quality glasses hinted that he must not really spend his days tying rugs, but we tried our hardest to push that out of our minds. We’re pretty sure the man he introduced as his son holding his granddaughter was just a worker. I mean, they had an outhouse with an English toilet in it on the other side of their field… but that’s OK… You just hope that the men and women who do tie those rugs daily get their cut of the rugs he sells as an “authentic Rajasthani weaver.” Because no matter what system they set up, these rugs were being woven by hand by real people. No “Made in India” sticker necessary. Why am I over explaining this? Because I caved and bought one. Sure, I brought the price down from $450 to $300, but I probably could have pushed for $250. I mean, he has a credit card machine. When I saw the sea foam rug, I couldn’t resist. Everything else in India is bright and bold or a rich rust and brown. This rug is now in daily use at the foot of my bed. Our last stop was a wildlife preserve. The evening camp excursion is a popular one in many desert tourist destinations around the world. I went on one in Dubai as well. It includes a performance with traditional dancers and musicians, drinks, a meal and a camel ride. For me this falls into the category of “not necessary, but better than staying at the hotel.” I preferred the one in Dubai because it included henna. This one felt a tad lackluster because there were few people there. If any of my fellow travelers comment below, I’ll include their thoughts. Pick a camel, any camel! This fort was built-in 1460 and towers above the blue city. 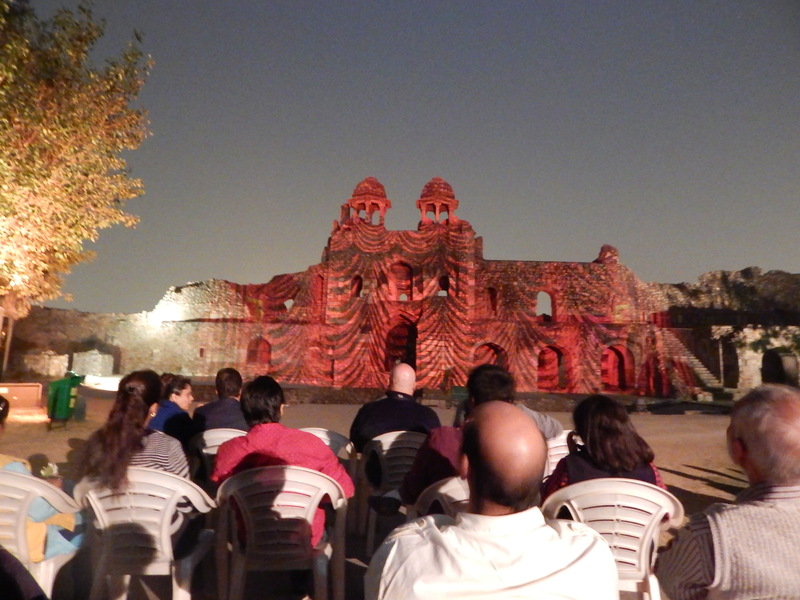 Still privately owned by the royal family, this fort has been used in many movies and requires constant fundraising. The fort and its 7 gates were built for battle. As you walk through the imposing main entrance – the Iron Gate – you will see metal handprints sunk into the wall. They represent the royal wives who committed suicide on their husband’s funeral pyre, a tradition known as sati. Morbid and heartbreaking, it is good to know that the British outlawed the practice in 1867 and the last recorded sati in Jodhpur was 1953. 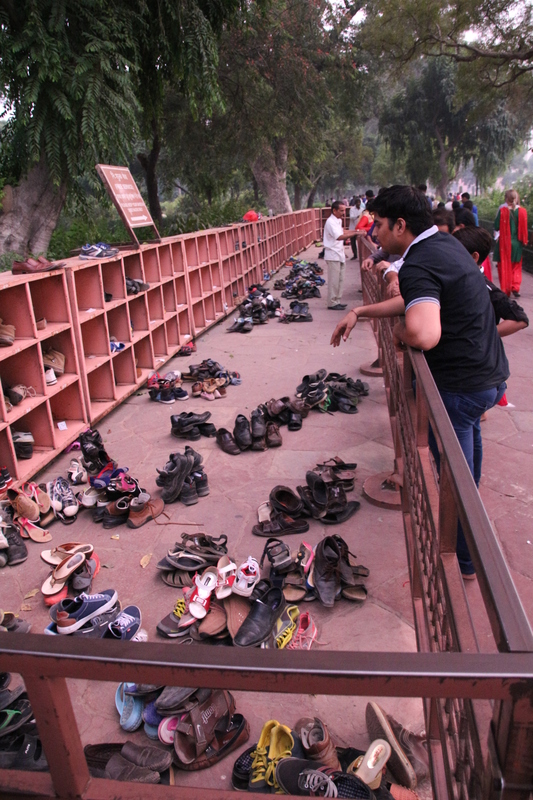 Unfortunately, the Indian government did not pass a Sati Prevention Act until 1987. I had a blast in the museum gift shop. Reasonable prices were fixed and clearly marked. They had a large selection of hand-printed “old” documents. The quotations are because I’m not sure how old or authentic the paper was, but the paintings are exquisite. I bought adorable cards with hand painted auto rickshaws and parchment bookmarks with painted elephants and horses for 100Rs each ($1.50). There were books, purses, jewelry and more. All proceeds go to keeping the fort maintained. I absolutely love a good story, and curse-stories are some of the best. When Rao J odha, the chief of the Rathore Clan, needed to establish his dominance after traveling 15 years in the desert, he knew he had to build a fort. The current location was the most strategically advantageous, but a local hermit was furious that he would be displaced. He cursed the king and the fort, saying that it would never have water. Rao Jodha believe the hermit had the power but could not stop his plans. So he built a temple near the hermit’s prayer spot. But at the time, it also seemed necessary for a human sacrifice. A local man Rajiya Bambi offered himself to be entombed in the wall – alive. In return the royal family promised to take care of his descendants. 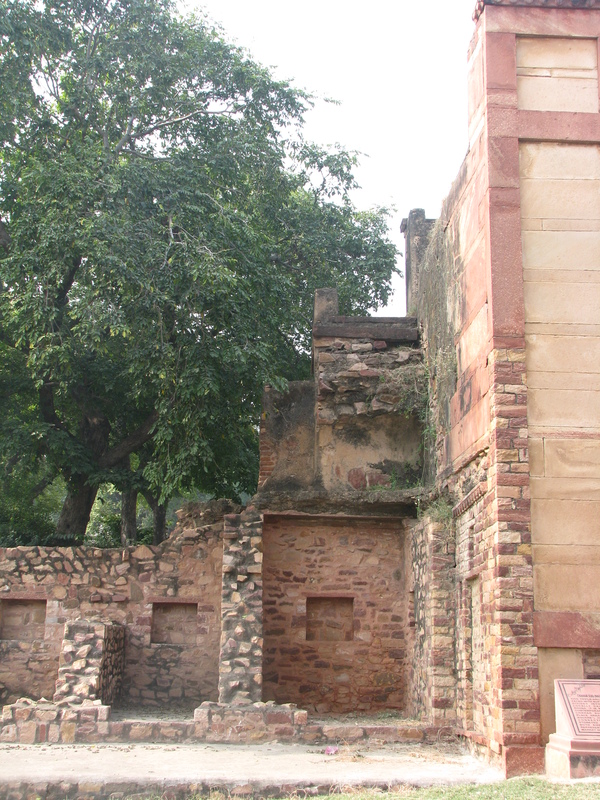 To this day, the family lives on the property bestowed by Rao Jodha. 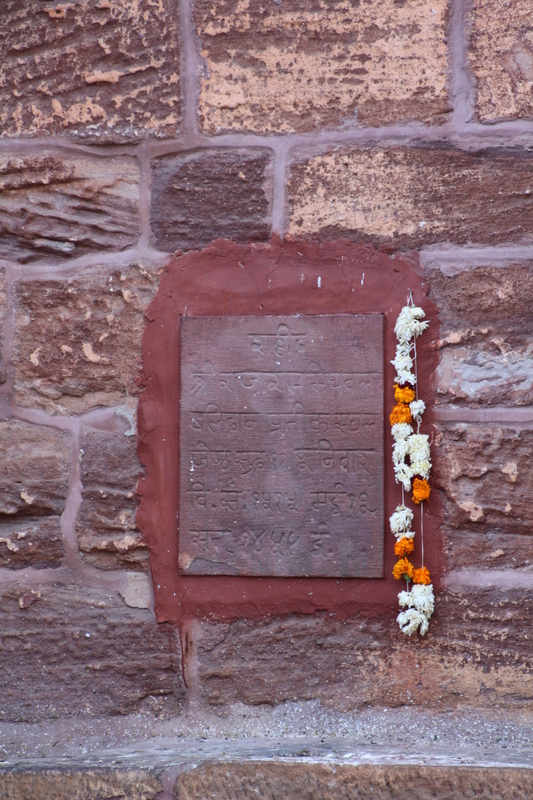 To the right is his headstone along the fort’s wall. This mausoleum built in 1899 is covered with intricate carvings. It gleams white in the sun and is surrounded by impeccable landscaping. I could have sat there for hours if we didn’t need to get my aunt, sister and BIL to the airport. There is an extra charge for cameras so we opted not to bring. This photo doesn’t do it justice. 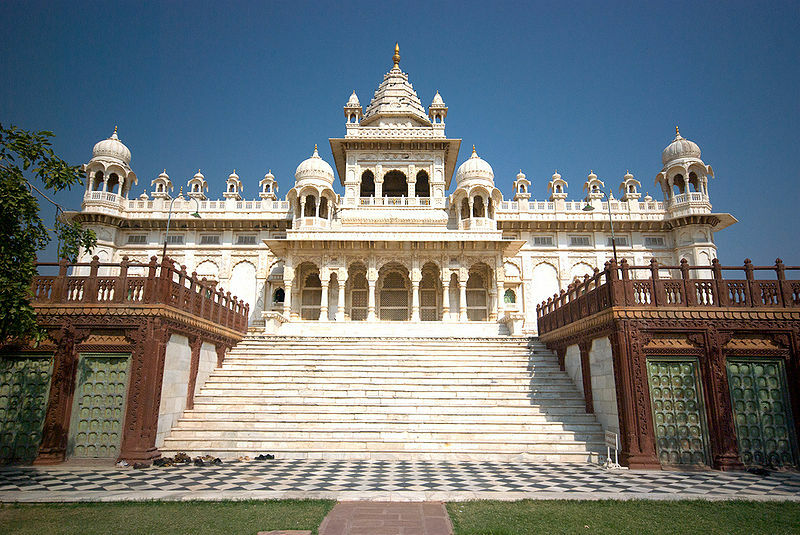 This palace, completed in 1943, was the last palace built-in India. It was constructed to employ thousands of people during a famine. Owned by a royal family, it is one of the largest private residences in the world. 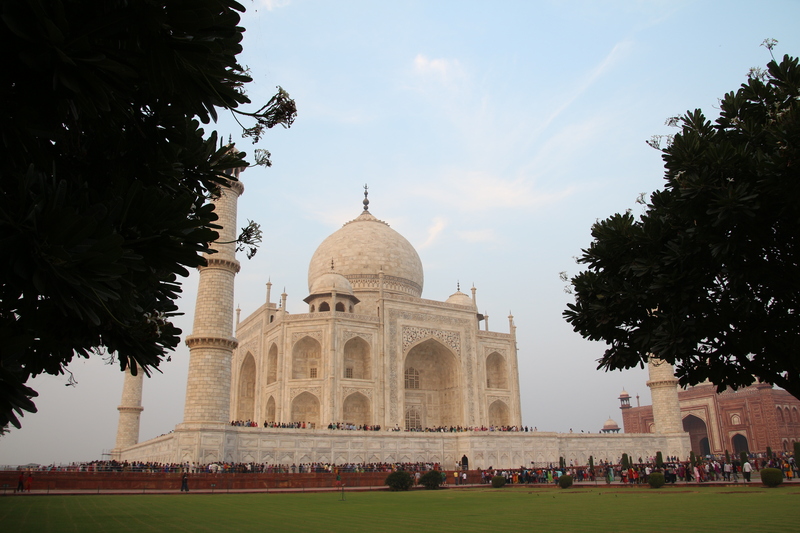 You can visit a relatively small but interesting museum that focuses on the 20th century, but the majority of the palace is run by the Taj Hotel. There’s a significant fee to go into the hotel if you are not a guest. The museum includes models of the hotel and photos of the portions you can’t walk through, as well as many gifts given to the family throughout their reign including rare jewelry boxes, pottery, clocks, art deco paintings and more. I liked it particularly because you get to see the recent past, including photos and paintings of the family in recent years. This is a story straight out of a movie. I would love it, if it didn’t actually involve real life tragedy. As it was told to me, the hermit who cursed the fort also cursed the Maharaja’s family, but online it seems that most think it is a simply an unfortunate jinx. The jinx: a Maharaja will never live to see his grandson. Shockingly this has proven true for 5 generations. The jinx began in 1895 when Rao Jaswant Sing II died while his eldest son was only a child. That son died at 21 and his heir at 20. 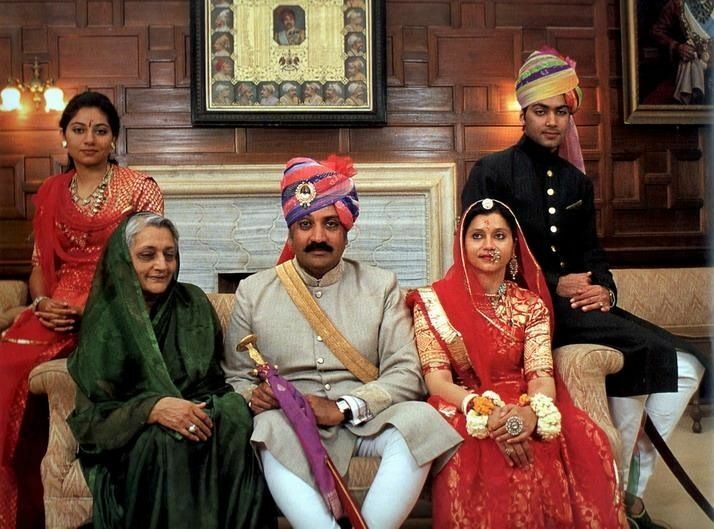 Maharaja Umaid Singh lived to see his granddaughters, but his son died in a tragic plane crash at the age of 29. The jinx almost continued when young Shivraj Sing nearly died in a polo accident. However, he was able to partially recover and his family welcomed a son this November (2015)! The last Maharaja of Jodhpur Gaj Singh met his grandson, breaking the jinx. At least it has a happy ending! The guide brought us to a relaxing lunch at a mid-priced restaurant called On the Rocks. The ambiance is its strong point as you’re nestled away under a large tree in an enclosed patio. 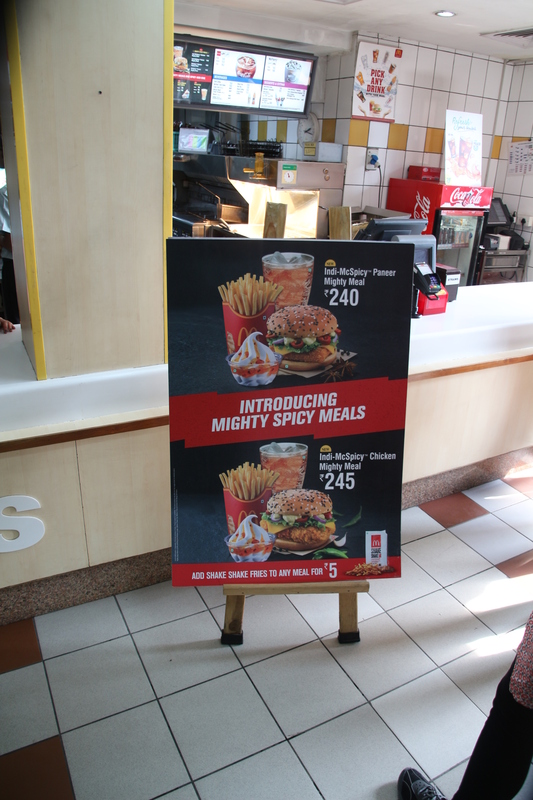 The menu includes Indian, Italian and Chinese a la carte. The price adds up, but the quality is good. Indique is the open air terrace restaurant at the Pal Haveli Hotel, the converted former residence of a wealthy local family. There’s a beautiful view of the lit -up city and clock tower. I don’t have many pictures because we arrived when it was dark (I stole this one sorry!). 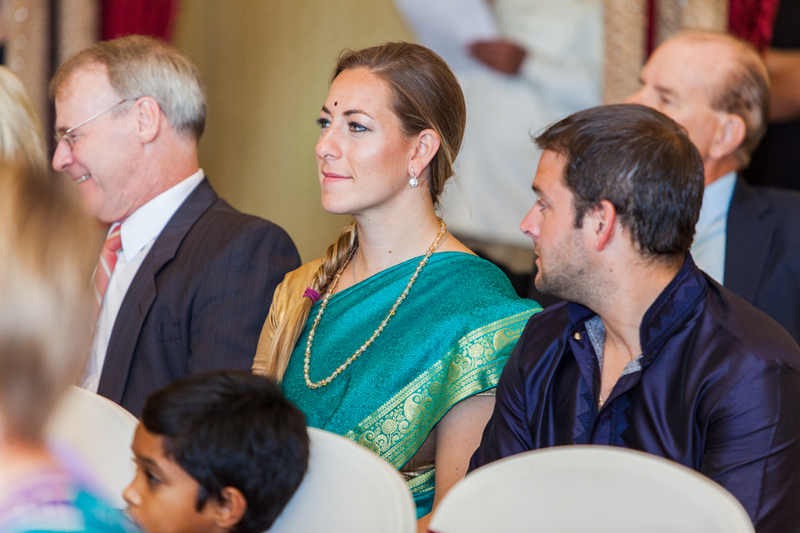 This was possibly the first and only time my family got to experience auto-rickshaws – and so glad they did! Warning: you have to walk up a few flights of steep stairs. The ambiance was charming and romantic, though I do suggest you bring a jacket just in case. We had thalis with a choice of veg or non-veg. It was delicious! Every dish was fantastic. I knew immediately that this would be a food highlight of the trip. 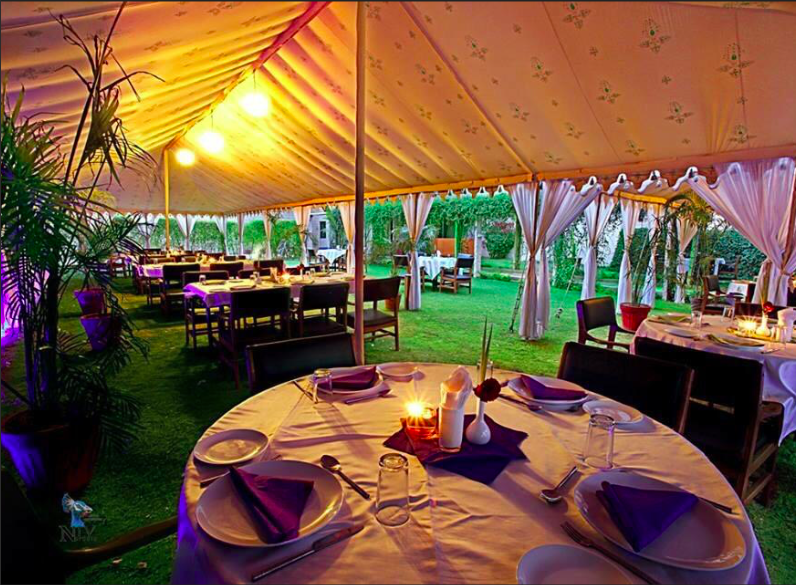 A nice local restaurant under tent on a lawn, tucked away from the street. They’re clearly used to foreigners. Trip Advisor reviews say the locals recommend it. We only found it because out guide knew of it. This mid-level price hotel was a perfect choice. The rooms were large and clean. We were given one suite with a large seating area. The breakfast in the morning was a large spread with manned egg station. And we had dinner there one night as well, which was also delicious. 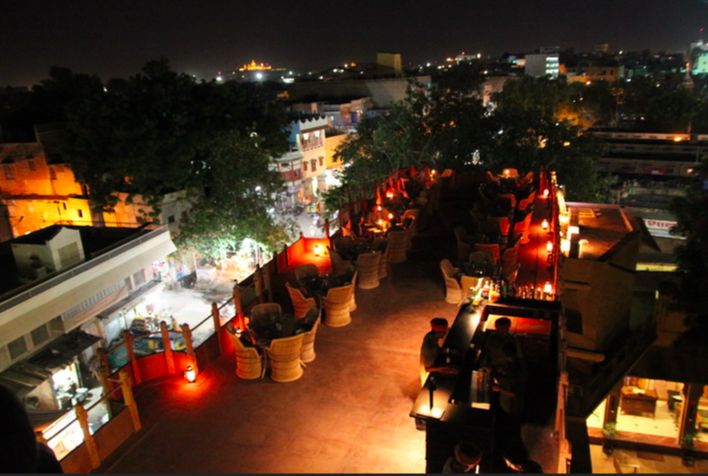 There’s even a roof-top bar that is trying very hard but doesn’t quite hit the mark with ambiance and drink prices. In general, this is a very safe choice for foreigners. 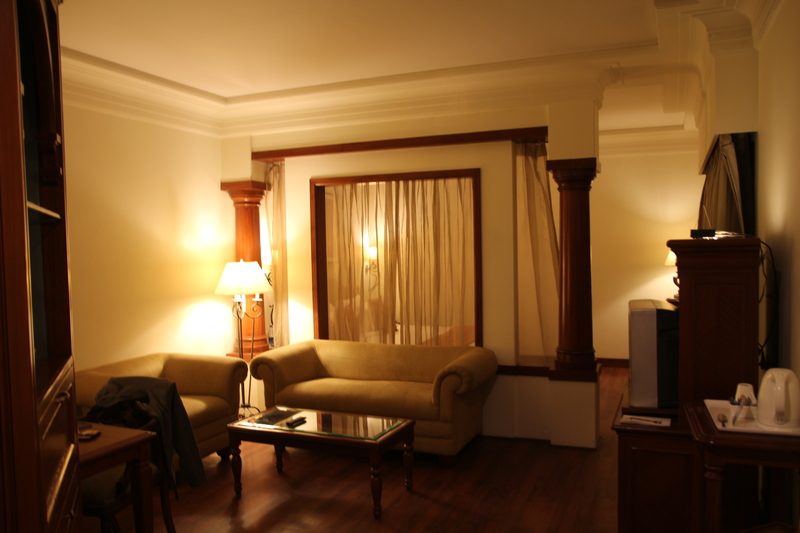 If you’re back-packing through India, this is not where you’d stay. If you’re traveling with parents, this is perfect. This was sold to us as an “export house,” which we thought would mean name-brand items. But what they meant was they ship out the traditional Indian crafts and textiles to American corporations like Pottery Barn and some bed covers to European designers. 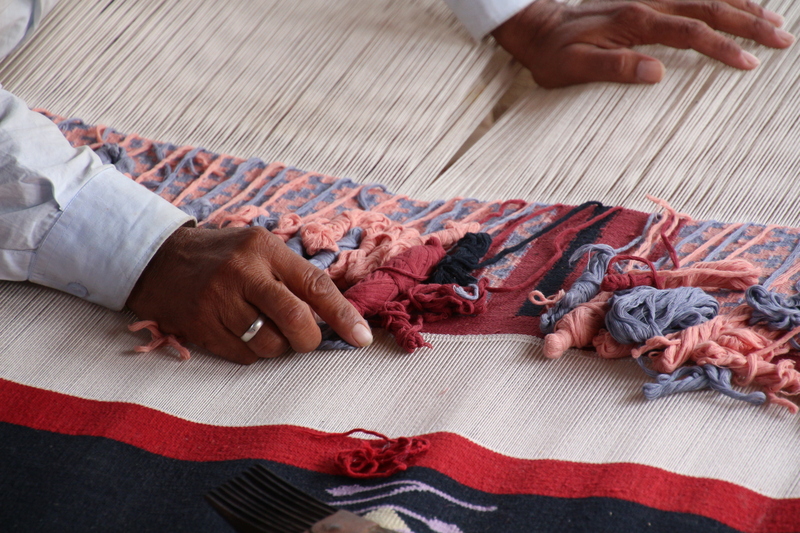 As before, the man laid out his many options, including pashmina shawls. He had the air of honesty, and truthfully, he had the best prices so far. He wouldn’t go too low, because it wasn’t in his interest – he was a wholesaler primarily. We bought shawls for gifts, including a thank you pashmina for all my mom’s help with the wedding. If you wanted to do all your textile and handicraft shopping in one go, I’d suggest this place. But don’t expect a Louis Vuitton outlet. You’ve survived the crowds to see one of the wonders of the world (the Taj in Agra), now it’s time to rest your weary feet at a desert Oasis. 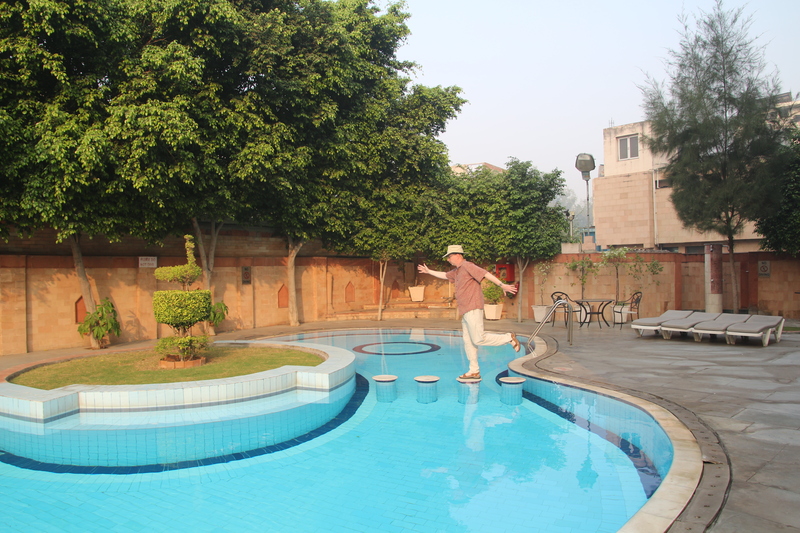 For us, that oasis was The Pugmark adjacent to Ranthambore National Park. 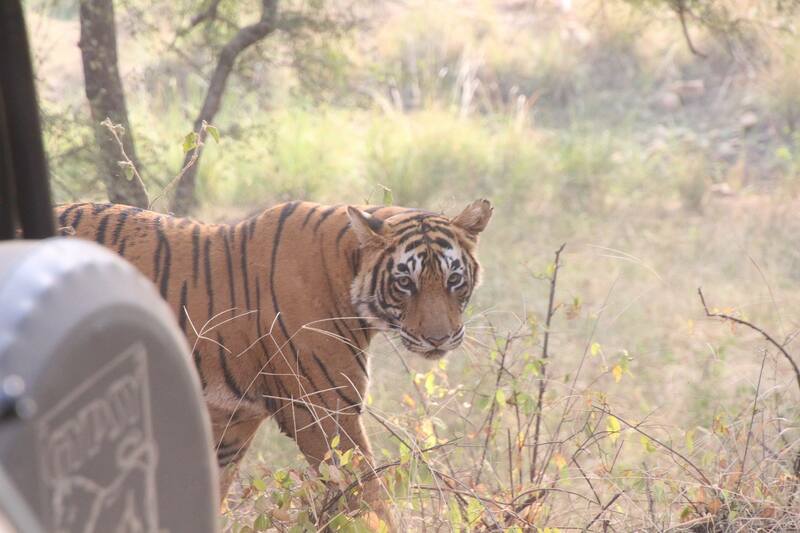 But don’t get too comfy, because you’re there for only one reason – to see the tigers! 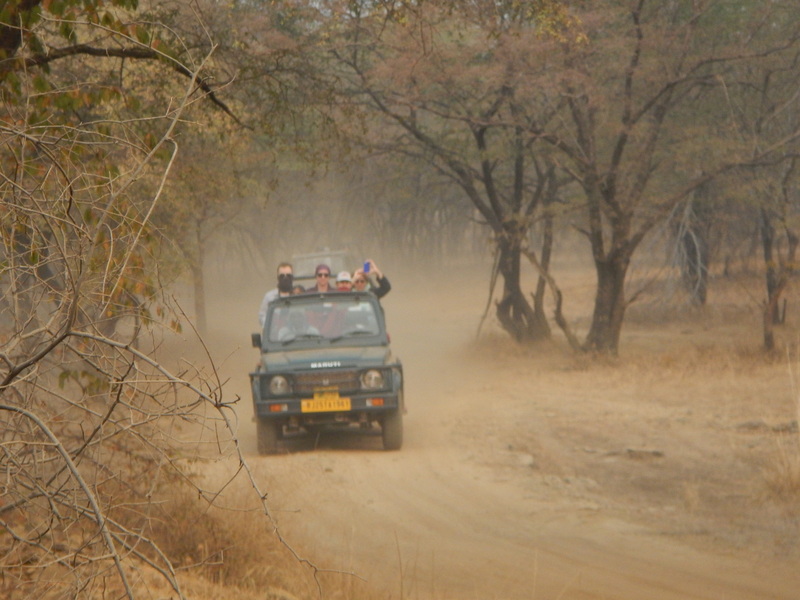 First deemed a game reserve in 1955, then the home of Project Tiger in 1973, the area became a national park in 1980. The park may be known for its tigers, (they currently claim a population of 62), but they also have a wide variety of other wildlife including: leopard, nilgai, wild boar, sambar, hyena, sloth bear, southern plains gray langur, rhesus macaque and chital. If you visit, remember that every trek is different depending on the weather, the season or simply whether or not the animals feel like getting up in the morning. Before we even arrived, two open air jeeps were arranged to drive us around. (Though I believe the hotel can also help you with this once you’re there). The morning of, we woke up at 6am for an early sunrise drive. I forget if this was because it was the best for cooler weather or because it was when the tigers are most active. Either way, we happily hopped in and drove about 5 minutes to the entrance of the reserve. 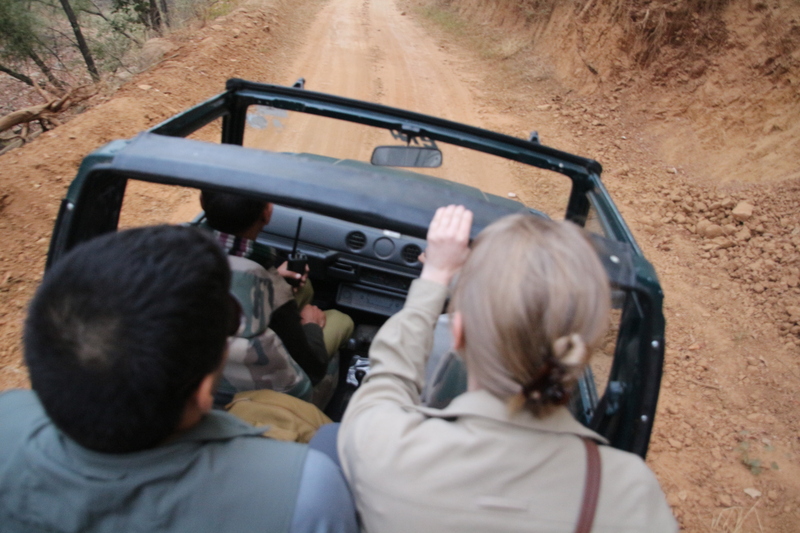 As we drove fast, slow, then fast again, our guide used a walkie talkie to discuss with other park rangers/guides if a tiger had been spotted. 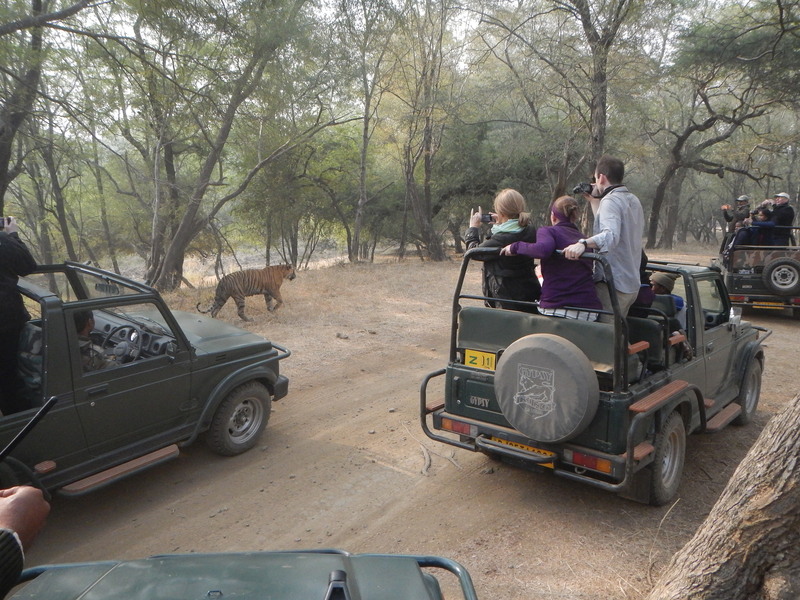 Once word that one of the majestic cats had been seen, it was a mad rush to get there and jockey for a good line-of-sight among the 15 other jeeps and trucks brimming with tourists. This ride felt more like the Indiana Jones ride at Disney than anything I have ever experienced. At the time, I didn’t admit to my family that this was actually my favorite part, not the tigers. The initial sighting. Can you spot her? After sitting around a lake and I embarrassingly mistook a bunch of leaves across the way for a tiger, we bounded off to another location and spotted one. She seemed to be lazily sitting enjoying the day. But after a moment, we all realized there was a deer-like animal grazing nearby. Over the next hour or two, we watched her stalk her prey by taking a few steps forward then sitting again… two steps forward then sitting again…. all downwind of the deer. Shockingly, the deer did not see her… that’s how slow she was moving! The guide said that this works for the tiger about 1 out of 10 times, but that it is OK. That ratio is built into their diet. Oddly enough, both animals seemed so used to the jeeps (and the jeeps remained far enough away) that we didn’t seem to factor into their process. Got bored waiting… so we decided to play with some birds. 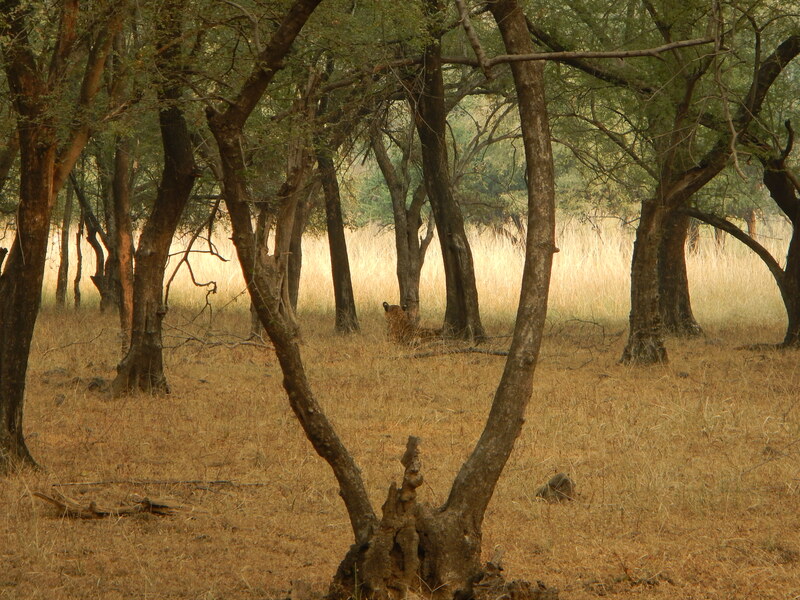 At some point another deer saw the tiger and alerted their friend. The deer bound off into the grass and our tiger decided to stroll elsewhere. We thought the trip was over, but the jeeps sprung into action and found their way to a road that crossed her anticipated path. We saw her take a little bath, spray some trees (you think a house cat can spray? You ain’t seen nothin’ yet!) and mosey through the line of jeeps. We were a few feet away! She strutted her stuff and could not care less that we existed. This was both fascinating and disconcerting. 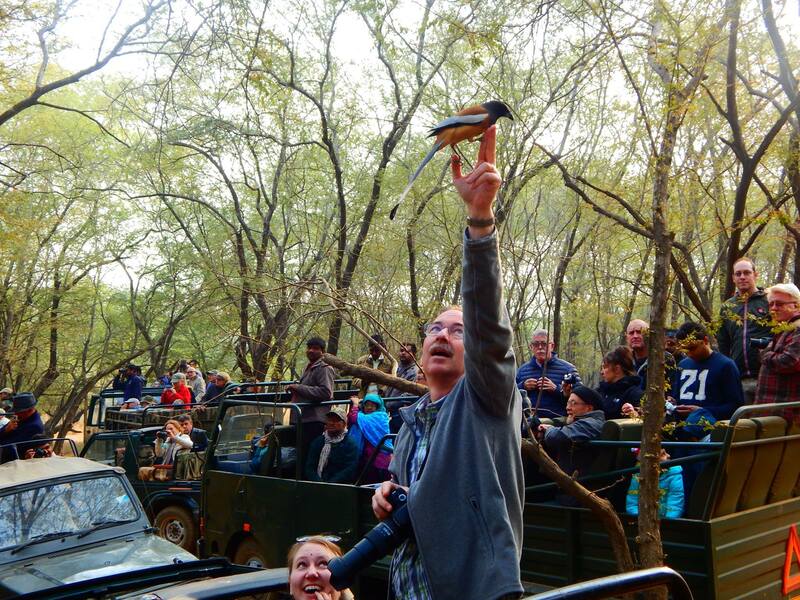 The environmentalist in me was nagging at me, and I hoped to goodness that the safaris contribute money and interest in preserving their habitat. I hope that the safaris are the lesser of two evils; the other evil being poachers and selfish land development. For every human that wants to create an untouched reserve, there is a human willing to exploit it. What to wear: I would be a horrible travel blogger if I didn’t warn you on what to wear. If you go out before sunrise it will be very cold, though it will heat up quickly. Also, it’s extremely dusty – everything you wear will have a thin layer of dust on it when you return. I also suggest bringing a scarf to cover your mouth if you think the dust will bother you. Lastly, make sure your hair is pulled back; you’re driving fast, and it’ll get in your face. 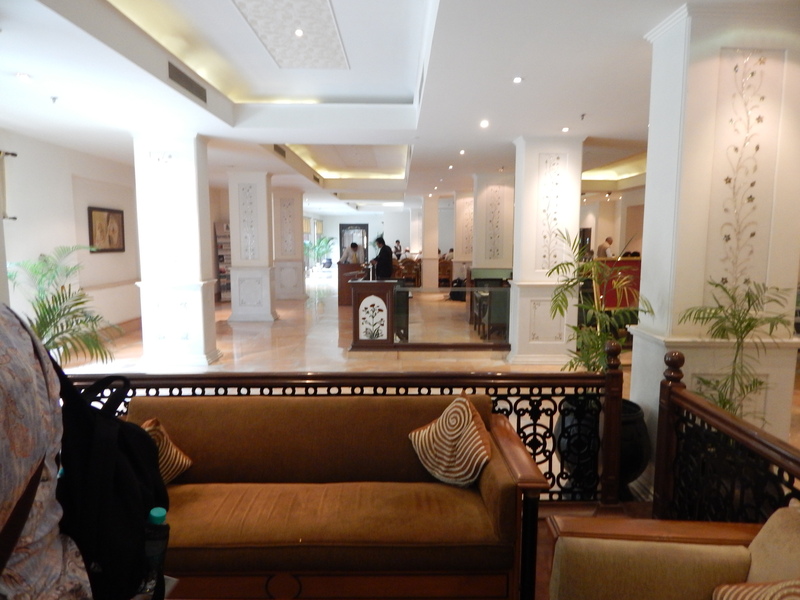 We were back at the hotel by 9 or 10 am for a very thorough breakfast buffet. It was my favorite breakfast buffet of the trip, because instead of doing a half-hearted attempt at American food, they embraced Indian food while having toast and hard boiled eggs for variety. 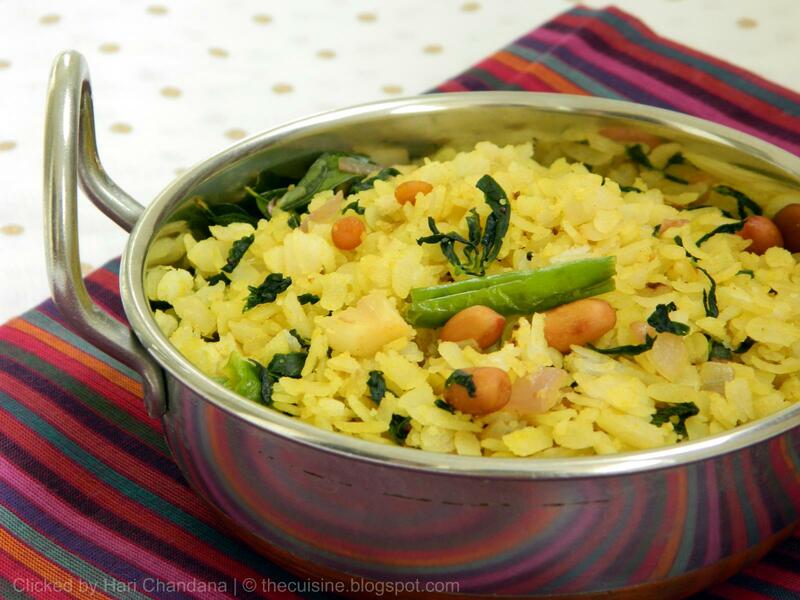 Poha is a great cross-over Indian dish for breakfast – hearty but not “strange”. Our little oasis. Clean, spacious rooms open up onto a center strip of trees, flowers and adorable sitting areas. We didn’t have enough time, but there was a beautiful blue pool. The staff was polite and efficient. Meals were served buffet style in a large room. Alcoholic drinks were offered, but with a glass of wine clocking in at $13, we stuck with the 650ml Kingfisher for 400Rs ($6.50) split among 2-4 people. Honestly, we were sad that we couldn’t spend another day there just to relax. 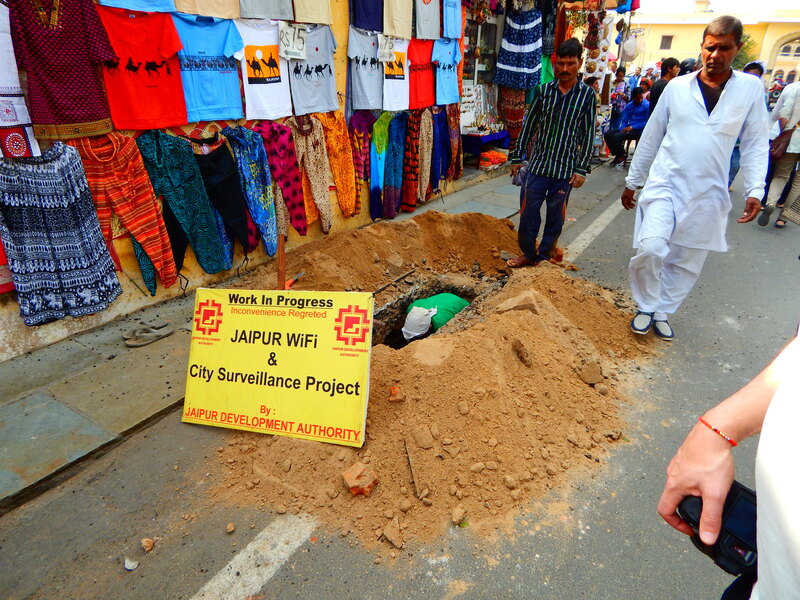 We left by noon to reach our next destination – Jaipur- a city very close to my heart. 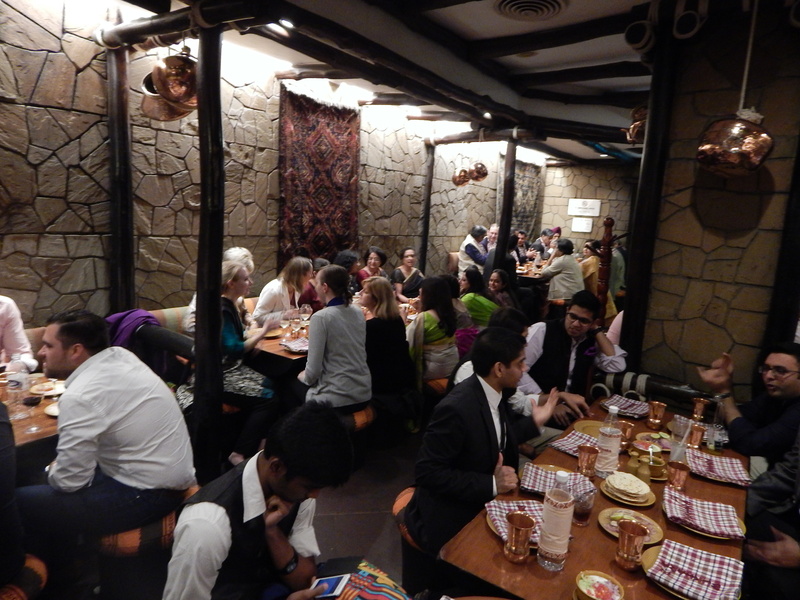 A medium sized restaurant buzzing with activity. And that’s no surprise with a $45 for 12 piece omakase. As my friend mentioned, it’s a 1/3 the price without being 1/3 the quality. In fact, from my novice POV, I felt they were more creative than Kura with interesting toppings. Take a look! At this point, I just want them to torch everything! Adds flavor and texture! 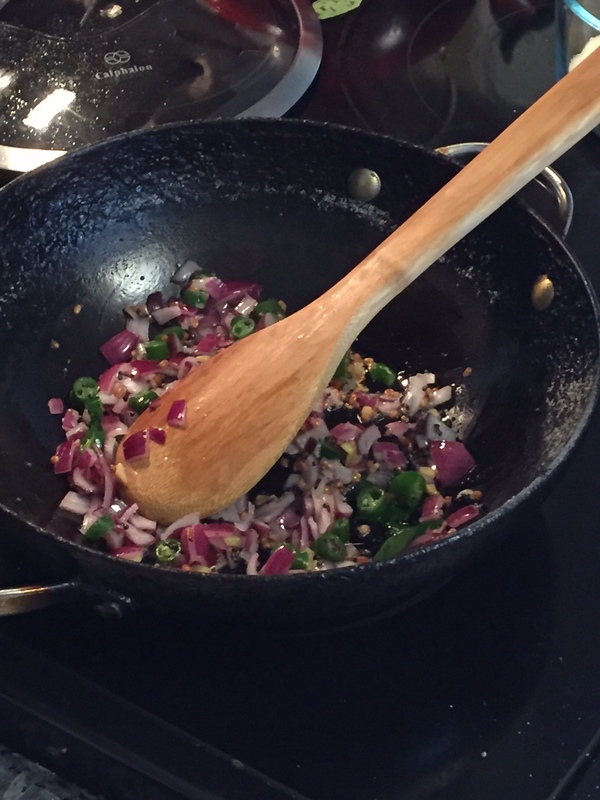 I won’t lie, the marinade gave it a tasty kick! Two Omakases. Two very different prices. Both delicious. I returned home satisfied and feeling much more educated about the flavors and etiquette of sushi. I have enough memories that I feel I can reminisce about the delicious pieces without having to run out and plop down a chunk of money every week. Average sushi will get me through until I feel I need another indulgent omakase. My last note is that I suggest you go with good company to fill out the time and share your experiences. Thanks Uni Diaries 🙂 But also, don’t be afraid to ask the chef about what you’re eating. As a part of my job, I was browsing the internet for telegenic chefs. Time and time again I came across beautifully shot, mouthwatering videos on sushi and the chefs who create it. The chefs themselves didn’t fit the bill for what I needed, but my understanding and appreciation for sushi grew exponentially. Then Netflix’s I’ll Have What Phil’s Having‘s Tokyo episode pushed me over the edge. I needed lovingly crafted, top notch sushi, and I needed it NOW. Luckily, I’m friends with the amazing writer/food blogger of The Uni Diaries. A quick text put into motion my Sushi-palooza weekend. 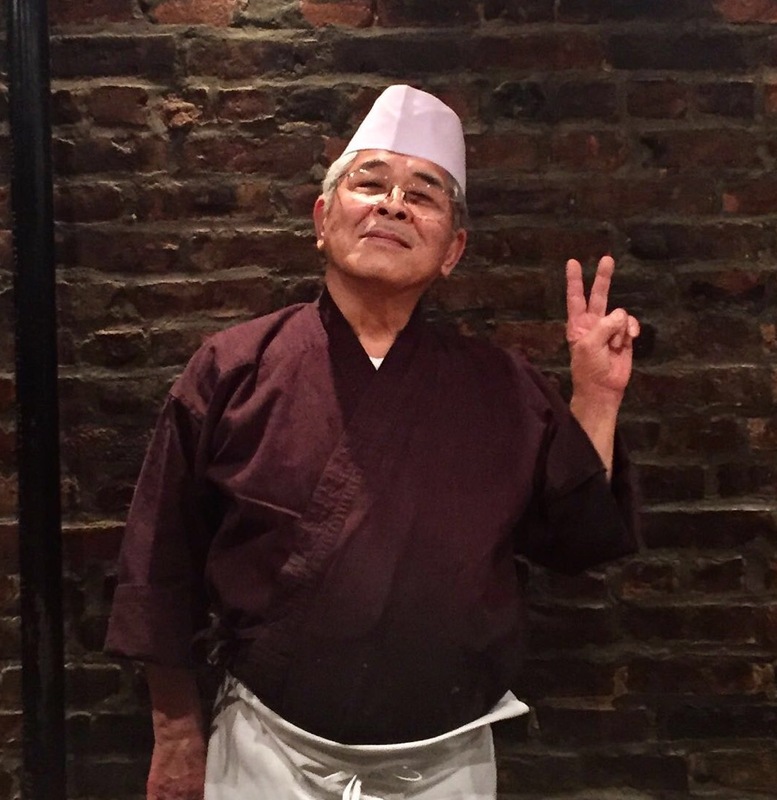 The goal: Have real omakase experiences – one well-known place (even if the price tag reflected it) and one lesser known, reasonably priced restaurant. Omakase: Term equivalent to “Chef’s Choice.” You choose the number of pieces you want to pay for and the chef presents them to you from lightest to heaviest dish. We sat for a 9:45 pm Friday res (the only time available when we looked a week before). After ordering a carafe of sake, I was ready to go… Clueless and excited, I just waited for the experience to happen. I love roe, and it was great safe start. The grated yam over marinated tuna was sooo delicious. So much flavor – smoky and rustic. Plowed through the squid, but not terribly memorable. The sea scallops were a silky delight. This fatty tuna was the first proof that I was at a new level of sushi. The average sushi eater is used to tuna, but fatty tuna is a whole new thing… a very melt-in-your-mouth bite. These were all smooth and delicious. I was thanking the ocean for its bounty with every bite. The seared mackerel had a crunch and salt that I appreciated after the more subtle salmon and amberjack. The baby shrimp was a visual thrill. This was certainly something I wouldn’t be able to get just anywhere. 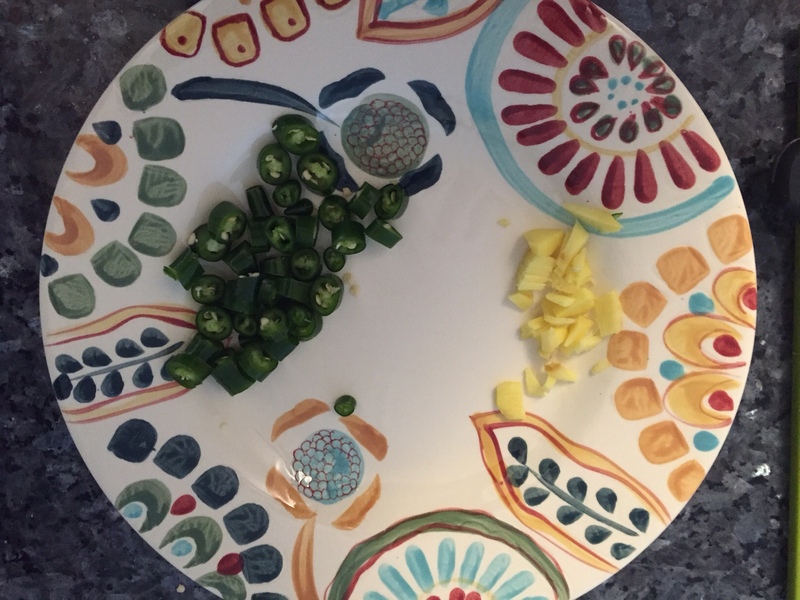 After slicing the octopus, the Chef tapped each piece to prove it was still alive; the white pieces seized up at his touch. These three gave a nice range of texture, the ocean eel being a favorite. The uni courses had arrived! 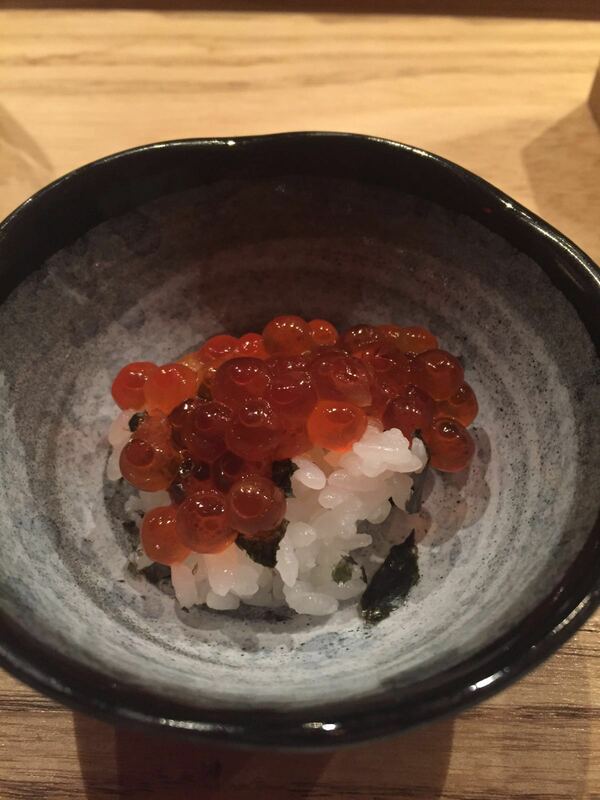 My fellow eater knew exactly what was coming, calling out the Santa Barbara uni vs the Japanese Hokkaido Uni. Uni is from sea urchin, and many sushi fans have a love/hate reaction to uni’s distinct taste. If you lose the taste of the ocean, you’ll love uni. A fan of oysters’ salty-flavor, I’m now a fan of uni’s concentrated burst of ocean. The fattiest torched tuna was the crown jewel. I literally woke thinking about it. We ordered an additional bite after it was all over, and my friend was in chock that it was even better than the first time around. What a treat! This may be what spoils other sushi for me for good. Mushroom soup finished out the meal. The overall take way is that omakase is a unique, elevated experience, but with the price coming in at $135 for 18 pieces, it’s a treat. A bucket list item, every penny was worth it. Thanks to my friend’s dedication to sushi photography, I won’t forget a single course. The plan for tonight is Sushi Yasaka, a cheaper omakase experience. The goal is to compare the two to get an idea of the spectrum. Looking forward to it! Here is the epic tale of my Mother’s struggles, so that you can skip the extraneous odyssey yourself. 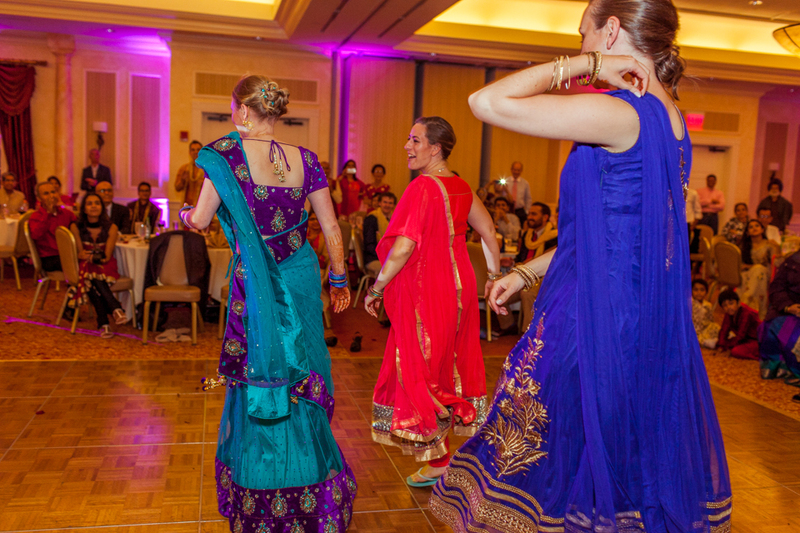 As Indian Weddings become more popular in the U.S. (are vendors see the $$$), there have been several Indian Bridal Expos popping up in major cities. My Mom went to one in Boston, and I visited one in D.C. Mom found two outfits that seemed fittingly formal: one for Dad and one for herself. 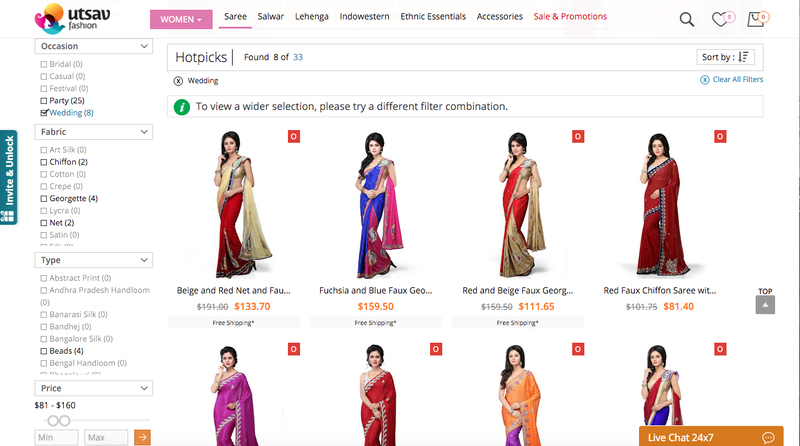 Since this was the beginning of the search, both seemed colorful; but as she would find out, American’s “colorful” is “subtle” in an Indian context. Excited about having an outfit and worried there would be no other options, she bought the gold and red, relatively muted salwar suit and a matching red kameez for Dad. She would ultimately wear this to both the sangeet and the reception in Mumbai. 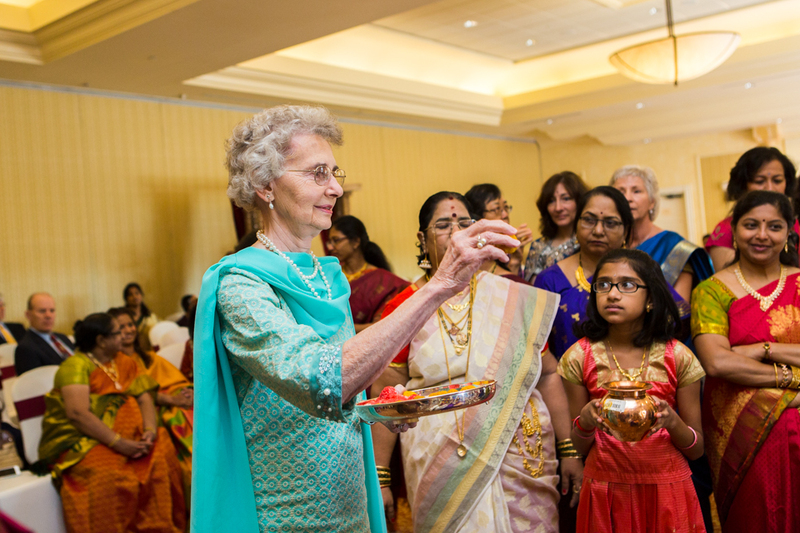 But if you knew my mom, you’d know that one was not enough… there may be a diamond in the rough waiting for her to find it… plus a growing number of relatives wanted Indian outfits, including my grandmothers! At the expo, my Mom found out that the majority of the “stores” in the U.S. are really just people who have brought back outfits from India and are selling them from their homes. Cons: You may find it weird to shop from someone’s home. Would they take returns and exchanges? Is it finding a needle in a haystack? My mom skipped this option. Cons: The prices are astronomical. $300 is a bit much for something you don’t feel confident in and know you’ll only wear once. Google brought my mom to the store Raj in Waltham. 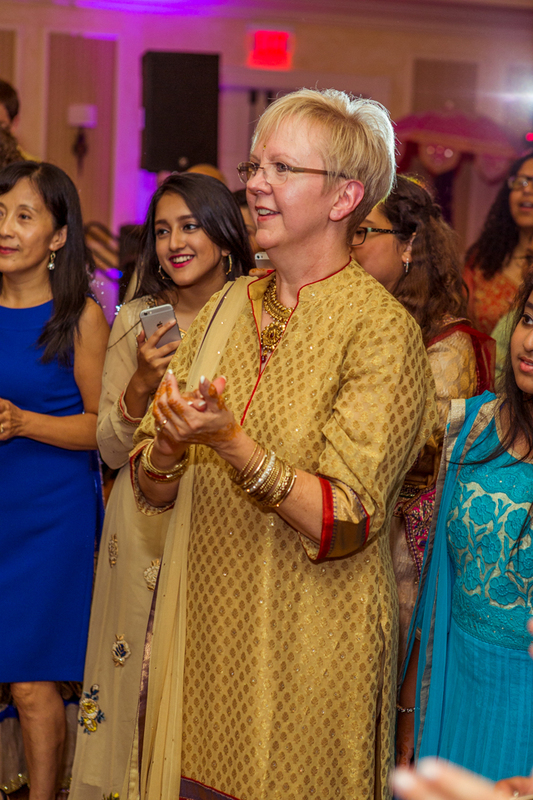 The pre-made outfits she was selling were far too expensive, but she offered a deal: if my mom brought the fabric, she would sew salwar suits for $60 each. This was music to my Mom’s ears. She could pick out the perfect fabric to match my grandmother’s favorite colors for a reasonable price. My Mom took the Raj owner up on her deal. 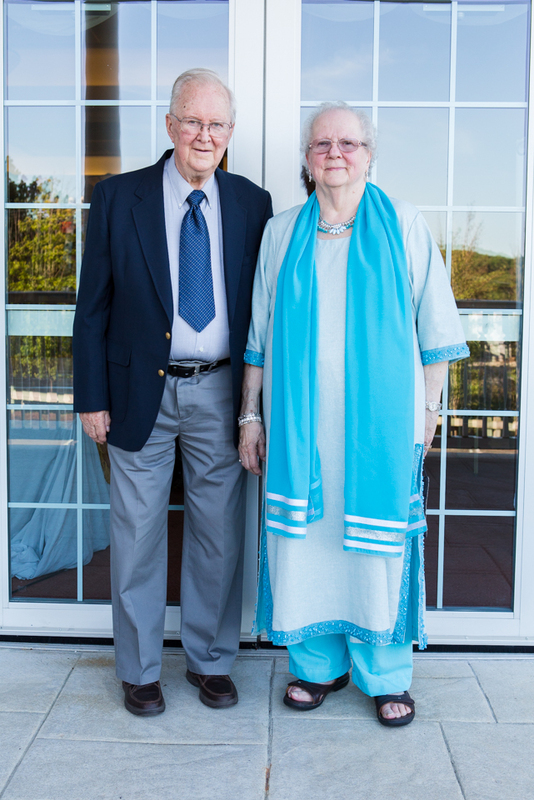 Together they drew an example of the salwar she wanted – the length and neckline. Mom picked up a light blue and light teal for each of my grandmothers, along with matching trim (aka bling) so that they didn’t feel too informal. The owner asked for her to bring back “Indian weight” cotton for lining. Add that to the bill. Next, the owner asked for an additional $10 because the trim was complicated to added. A seamstress herself, my Mom knew this was reasonable. Then the real trouble rolled in. As the wedding got closer, the delivery date kept pushing. My grandmothers were eager to try on their outfits, just in case they needed to find an alternative. My Mom isn’t terribly forceful, but she continued to follow-up until a week before the wedding, she finally got the outfits. The salwars weren’t as drawn: the necklines were different and lacked the princess seams my Mom asked for specifically. And Indian girlfriend warned me this is typical for Indian seamstresses; you have to be very present and pushy to get exactly what you want. They tend to improvise. Also, the trims were a bit loose, so my Mom re-secured the sequins and pearls. Conclusion: Overall, my Mom said she was 60% satisfied, but insisted the price was still a steal. My grandmothers looked and felt lovely, so I suppose you could call it a success. At first they were afraid, they were petrified… and then the cheap outfit they ordered arrived quickly and as pictured. After my Mom’s trials, my sister turned to the internet. Not only was she able to search and filter by the color and style that she wanted, but the prices were reasonable and shipping relatively quick. Warning: It may be a given that the outfits will need alterations. I’ve consistently found that clothes made in India are tight around the chest and armpits. Luckily, they also include a lot of fabric at the seams, making it relatively easy to alter. My Mom is a great seamstress and made small adjustments to most of my garments. Hopefully, you have someone nearby who can do the same! Conclusion: Go online! Even if the garments aren’t perfect, they’re cheap enough to come up with an alternative quickly. Check out Amazon.com and Utsav! 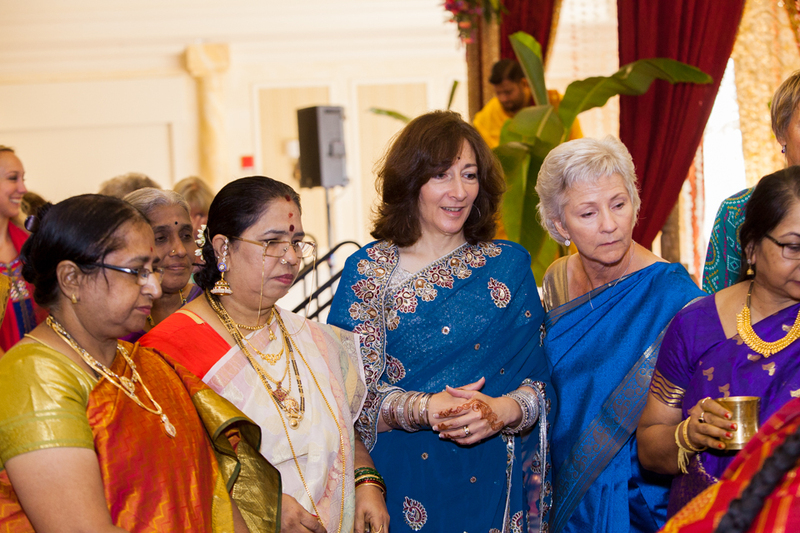 Sister/Cousins – Matching Sarees I asked my MIL to pick up. 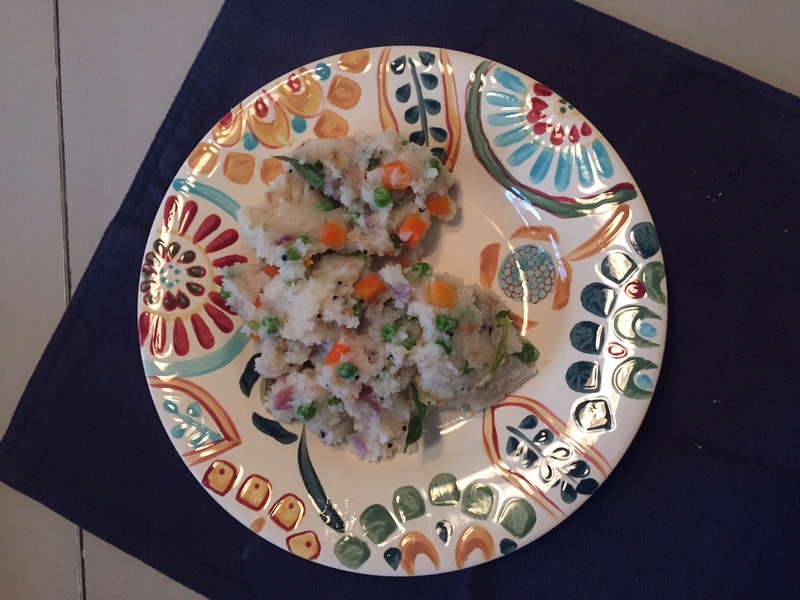 Upma is served in my/my husband’s family as breakfast, much like a hearty porridge, but Americans might feel it is more of a lunch or dinner side. Warm, hearty, filling with a zing. I’m sorry there are few measurements, but these are the types of things that are done from memory and to taste. 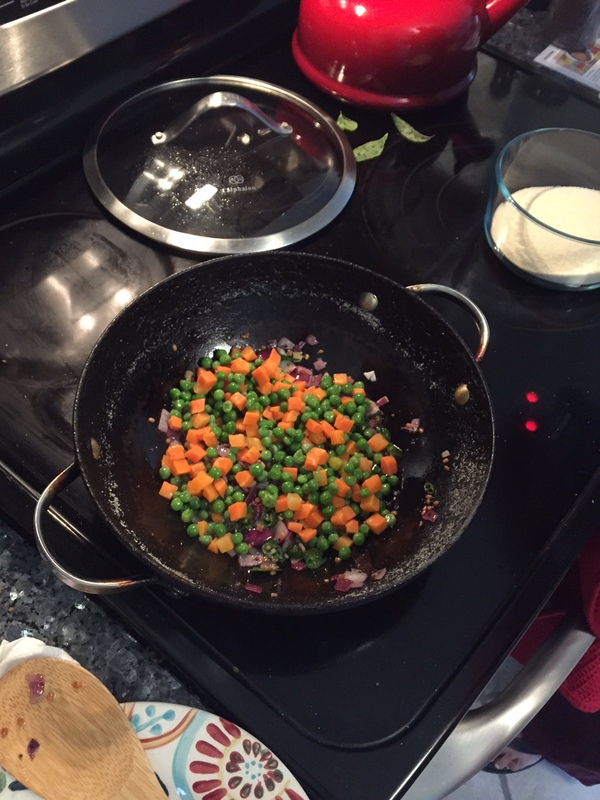 So try it first for yourself and then you can adjust the amounts of everything. 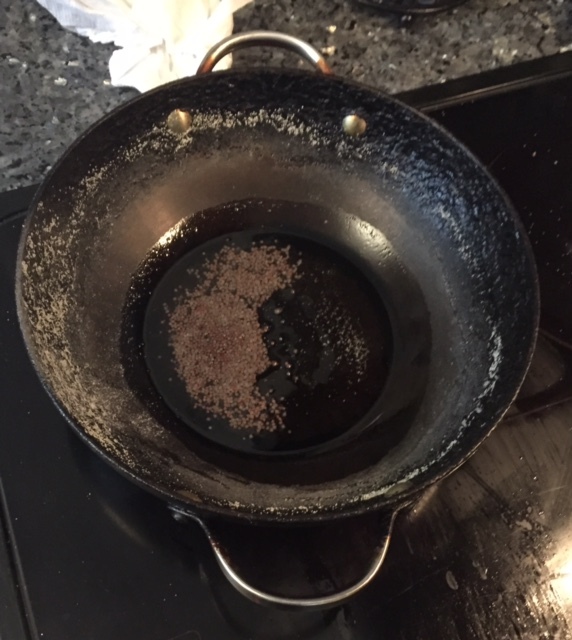 It doesn’t seem like a dish you can really mess up too much. Good luck! When it’s thick, it’s done! 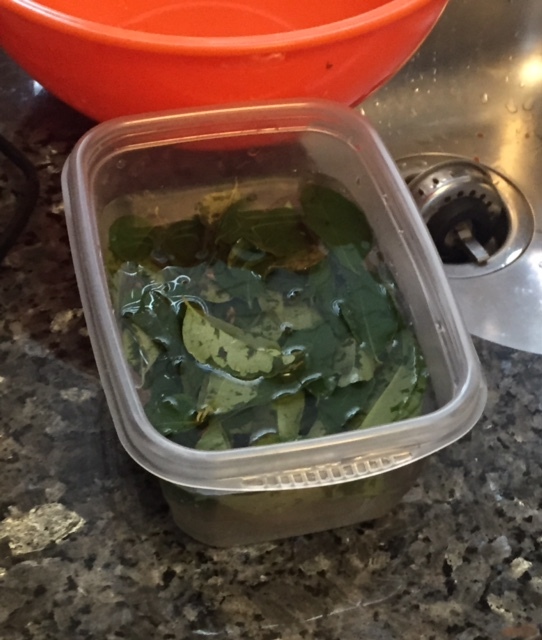 Side pointer from the FIL: If you trim the stems of coriander and stand the bunch upright in cup of water, they’ll last longer. 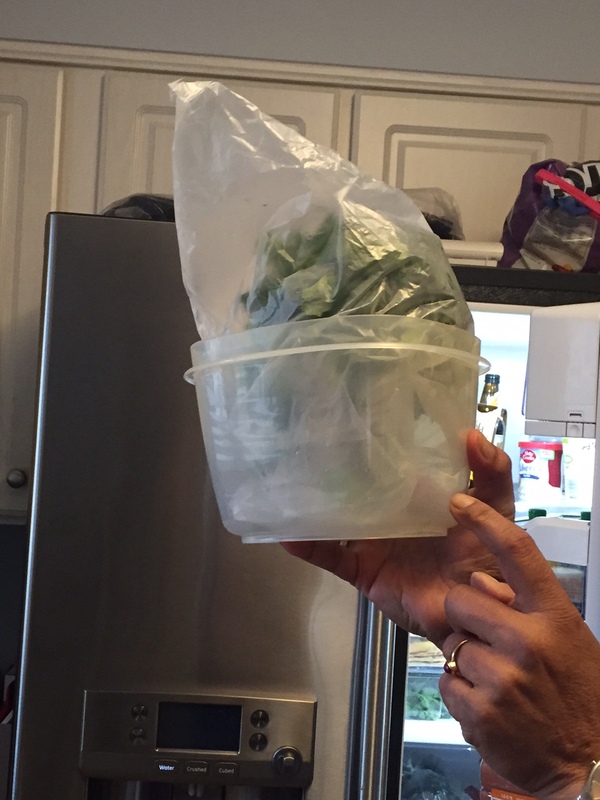 The Bag keeps the moisture in. p.s. Sorry the videos are HUGE. Still figuring it out. 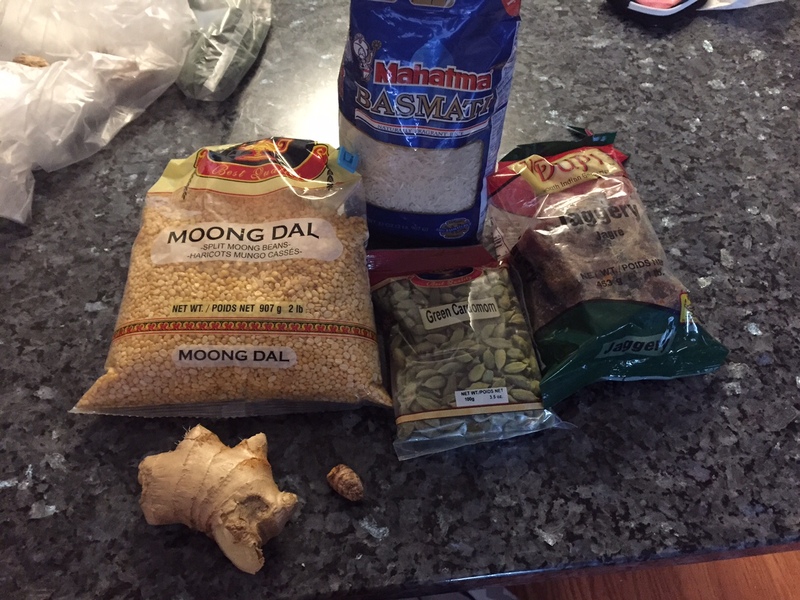 January 15, 2016 – Pongal! 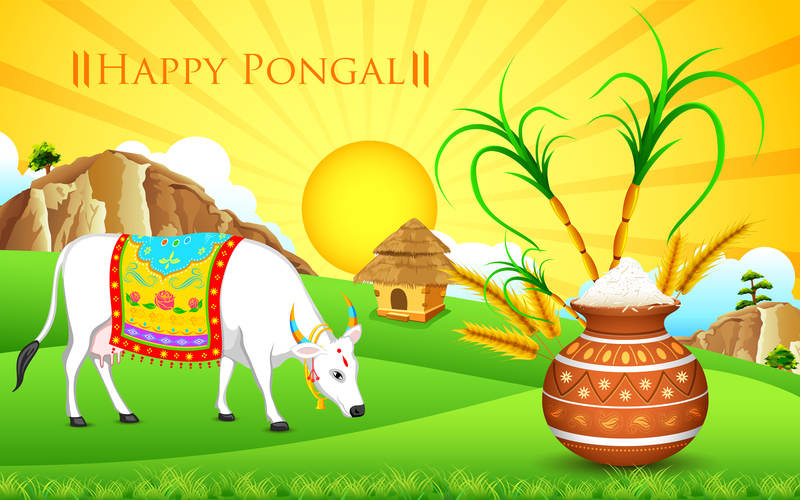 Pongal is the Tamil Harvest Festival (think American’s Thanksgiving). 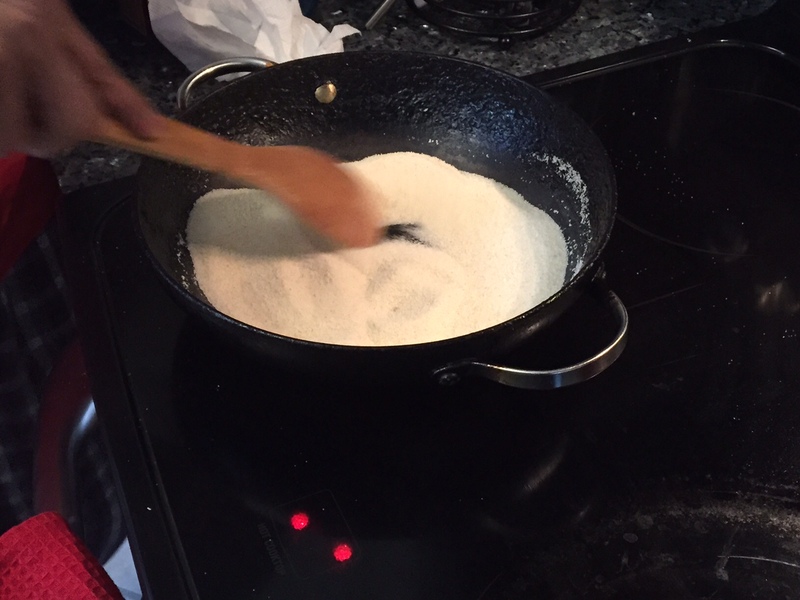 Wikipedia says it’s called Thai Pongal, with Thai indicating the Tamil calendar. But perhaps it is like French Fries or Belgium waffles – don’t you wonder what they call them in their namesake countries? Well, Tamils seem to drop the Thai. While the general feeling conveyed by my FIL is giving thanks to the earth for its bounty, further research indicates that the festival specifically thanks the Sun God for providing energy to the plants to grow. 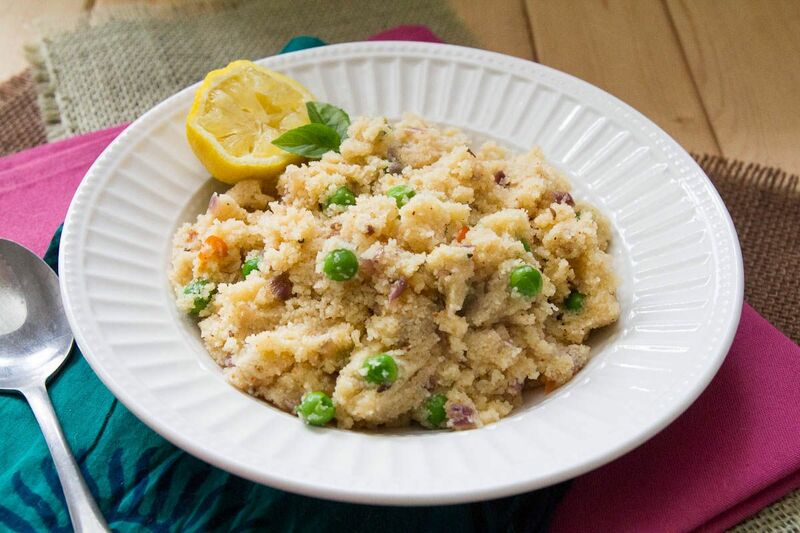 Pongal also means overflow and a type of sweet rice, both of which now come in to play. Wash up! You must be clean to conduct a ceremony. Don’t eat meat the entire day. Skip the eggs while you’re at it. 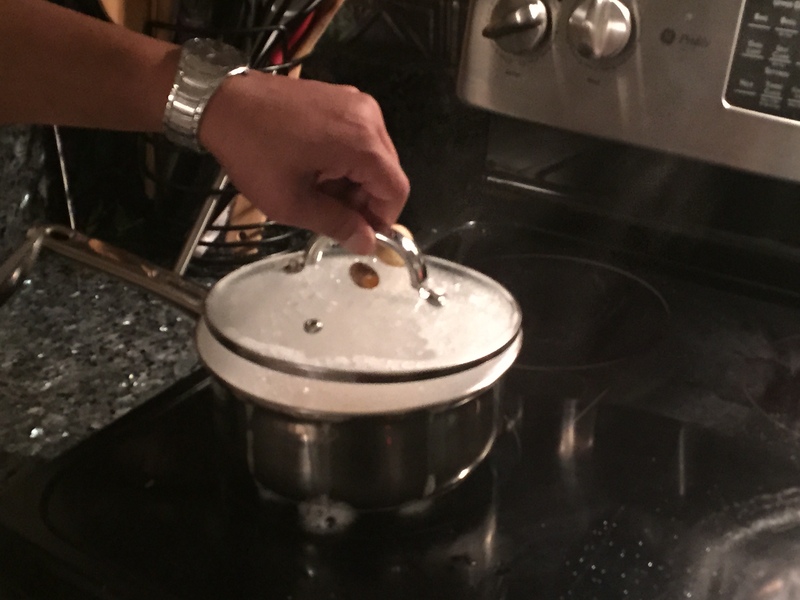 The froth may boil over… that’s ok – it’s part of the symbolism and celebration. 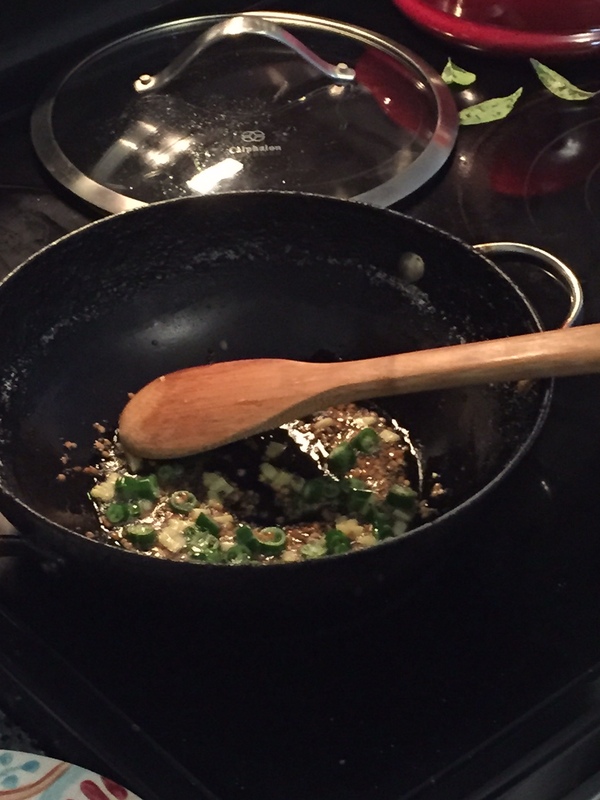 Play a piece of raw tumeric and ginger on the top of the pot, though it can also be tied around. 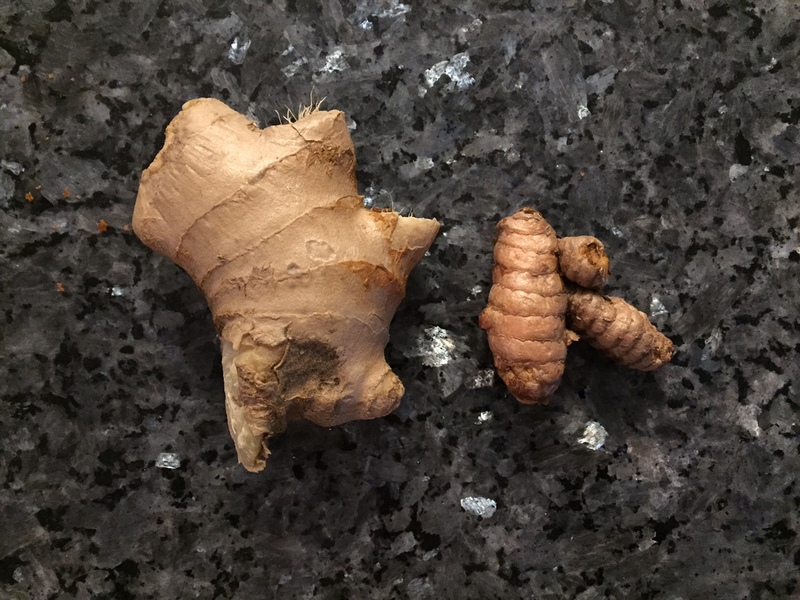 Tumeric is auspicious. Ginger gives you good health – it is both sweet and not sweet, which will help you get through the good and bad times in life. It will make you resilient. We all need that, right? 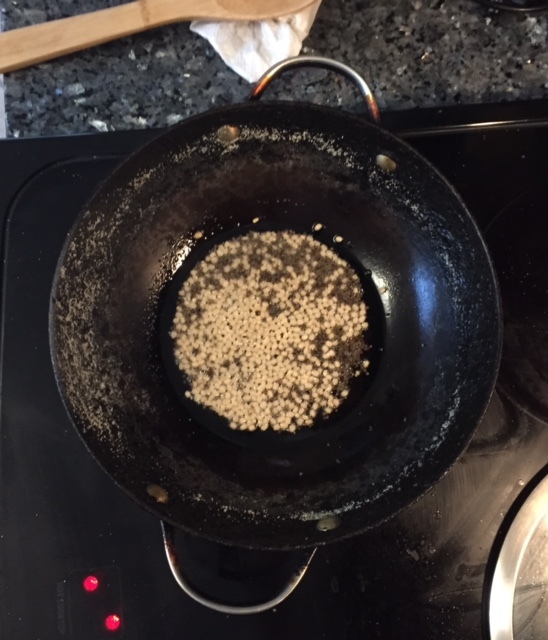 Add jaggery, a state of molasses/sugar, and cardamom seeds. There you go. You’ve celebrated pongal abroad. My next step included dashing off to work. But I can’t wait to celebrate this in its home state where I’m sure the multi-day festival will include much more. 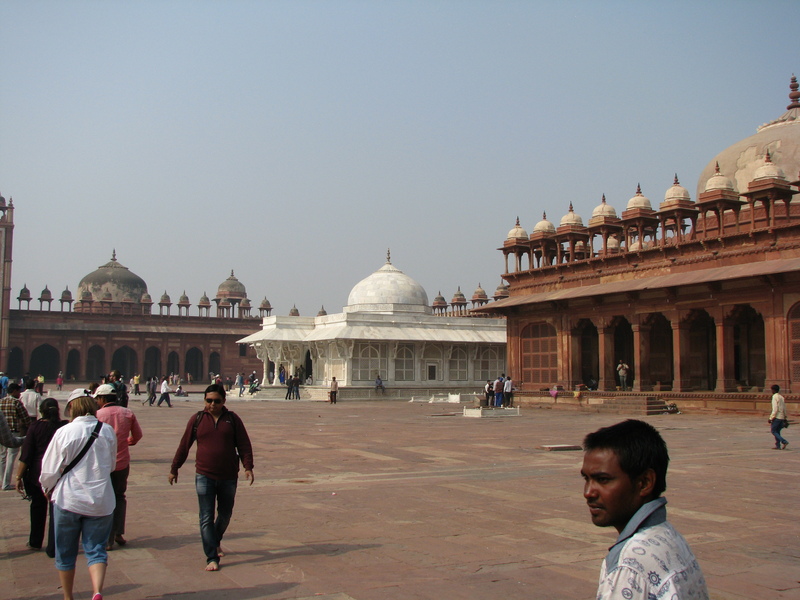 Hinduism involves a lot of ritual because the religion comes from a time when people did not read or write. Therefore, the consistency and repetition of the rituals helped people remember and pass down their traditions. It becomes a natural reaction, subconscious and automatic; all of the individual things blend together. “Like Ctrl-Alt-Delete,” he laughed.